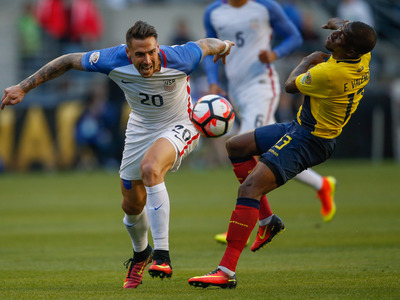 Getty Images/Otto Greule Jr.The United States Men’s National team beat Ecuador in the Copa America Centenario quarterfinals to make it to the semifinal round. On Tuesday afternoon, the United States will face off with Argentina in the semi-final round of the Centennial Copa America international soccer tournament. The US Men’s National Team has the chance to make history: Argentina is strongly favoured to win, but this tournament has been full of dramatic upsets and unexpected developments. In fact, this year’s tournament being played in the US is already historic, as the first Copa America to be played outside of South America. It’s a big deal, and I’ve really gotten into it. And one of the best parts of any big sporting event like this is keeping up with all the jokes and insights on social media as you watch the action on the field. But as the tournament has progressed, I started to notice something a little odd. On Facebook, friends, and friends of friends, started to complain here and there that despite their very vocal support of Copa America in their statuses and comments, those Facebook “reminders” were prompting them to post for EURO 2016, another soccer tournament in Europe that’s happening at the same time. 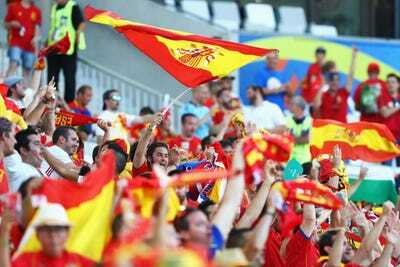 Getty Images/Dean MouhtaropoulosSpanish fans show their support in the EURO 2016 tournament. And on Twitter, I couldn’t help but notice that Twitter Moments — the social network’s big new feature, designed to quickly scoop up the best and most important things going on around Twitter that day — wasn’t posting as many Copa America stories and updates as it was for other sporting events, even at the tournament’s most dramatic moments. I thought this was kind of strange. In Facebook’s case, it reveals an interesting weakness in its all-important newsfeed algorithm; for Twitter, it shows the limitations of using humans to curate news. In both cases, it shows just how hard it is to personalise news for a world where people have a whole wide range of similar, but different, interests. That’s an increasingly important issue as social networks become primary sources of news for many people and as questions arise about the way different political and cultural perspectives are treated on the networks. Soccer, with its fierce loyalties and global audience, is perhaps the ultimate challenge for social networks. After all, catering to one set of soccer superfans is hard enough; building systems for two highlights the work that’s been done, but also how much further there is to go. It’s a demonstration of both the challenges and the dangers of social media’s power to guide conversations and inform. In Facebook’s case, you can largely blame it on the algorithm. There are a whole mess of factors that go into determining a) If you’re seeing a prompt to write a status about any given event, and b) which prompt you get. [Even] if your friend is posting about Copa a lot, he is likely getting EURO cup reminders because 1) People in his country may be posting more about Euro Cup [sic] 2) He may be a fan of a one of the teams playing in EURO, which would be a strong signal for us to show him EURO reminders 3) He may be receiving multiple reminders in the first place because he’s interacting with Copa reminders he gets, which is a signal that he may like receiving these reminders more generally. In other words, Facebook is guessing as to which soccer tournament you’re interested in, based on which teams you “like” and your behaviour on the social network. It’s good, but not perfect. 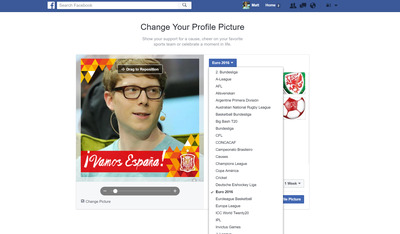 Screenshot/FacebookFacebook is offering temporary profile filters for both EURO 2016 and Copa America. It’s an example of the imperfection of algorithms when it comes to presenting you with useful, relevant information, which is basically Facebook’s stock in trade. It’s also a major reason why Facebook is investing so heavily in artificial intelligence technology, which can help it make better, more educated guesses on a massive scale. The ability to scan text and guess intent is one of the most valuable potential applications of AI, and it’s an area that Facebook has invested heavily in. Being able to process all the different ways humans show interests in things and deliver the right answer is going to be a real test for Facebook. 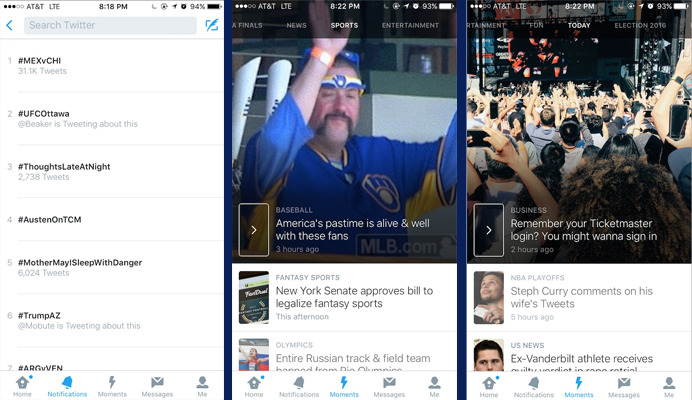 Unlike Facebook’s algorithm-driven approach to the Copa America and EURO 2016 tournaments, Twitter’s Moments feature is hand-curated by employees of the social network. “Our own curators do not act as reporters or creators of original content; instead, they organise and present compelling content that already exists on Twitter in a straightforward, easy-to-consume way,” says Twitter’s official Moments guidelines. I’ve checked the Twitter Moments sports tab myself several times a day for the duration of the tournament, and anecdotally, I’ve been dismayed to find that many news stories from the Copa America are routinely placed below updates from EURO 2016, NASCAR, the NBA Finals, and MLB baseball, if they’re posted at all. Indeed, in my own experience, the only Copa America games to warrant Moments are ones where the US was playing. Presumably Twitter users in Latin American countries might have found more Copa coverage in their regional versions of Moments.But the lack of Copa Moments in the US shows that there’s still work to be done appealing to diverse audiences within the US. Case in point, when Chile beat Mexico 7-0 Saturday afternoon it topped Twitter’s trending topics, which are automatically generated… but I was disappointed that there was no Moment of the big game to be found. Screenshot/TwitterIn these screenshots, taken shortly after the conclusion of the disastrous Mexico/Chile match of the Copa America, you can see that #MEXvsCHI is a top-trending topic on Twitter…but there was no Moment on either the main or sports pages. It’s a mistake to assume malice. Moments is still a very new service. When stories like this are done by real actual humans, sometimes unconscious bias seeps in. Maybe whoever was on Moments duty after that game was paying more attention to another story or another game. Or perhaps nobody was on duty at all. These things happen. This is also sort of similar to the hot water that Facebook found itself in around its own Trending Topics, where questions were raised over the human curators who were picking the news stories and topics that are highlighted in a special section on the service. The thing that I want to leave you with here is that it’s very hard to curate anything to appeal to everybody. The major social networks are growing in both power and influence, shaping national conversations. And more Americans are getting their news that way than ever before. So using the tale of the two soccer matches as an example, I hope that Facebook and Twitter keep in mind that maybe they can’t keep everybody happy — but when they get it wrong, people notice.